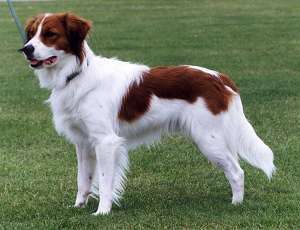 The Kooikerhondje, also known as Kooiker Hound, is a small breed of spaniel type dogs which emerged in the Netherlands during the 1500s. It was made to be used as working dog, especially to allure and hunt ducks. Kooikers became immensely famous during the 17th and the 18th century and thus appeared in the paintings of famous painters like Rembrandt and Jan Steen etc. It almost ended after World Was II and was revived in during 1940s by Baroness von Hardenbrock van Ammerstol. The breed is becoming famous in the US, Canada etc but it is still extremely rare and hard to get. It is medium sized dog that is very courageous, universal and cautious breed which can extraordinarily flush and retrieve fowl. It is a very active, observant and good natured dog and is thus not advisable for homes with small children or loud bossy children. They get along well with the family and the pets that they have been raised with but are wary towards strangers. They are excellent as hunting companion as well as adorable family pets. Kooikerhondje should be brushed occasionally and bathing should be done only when needed. Moreover, ears should be checked and cleaned on a regular basis. It is a breed with double coat with the outer coat being medium to long in length, polished and slightly wavy and the under coat is short and thick. It is very sensitive and thus must not be treated harshly and the training should be done with mercy, justness, patience, devotedness and consistency. It is not suitable for apartment or city living and will do best in a rural environment with place to run, hunt and play in because of their love for physical activities.